the perfect place for nomadic spirits to call Home! Celebrate life, love, family, friendship, the achievements in this little corner of paradise in the Atlantic forest, close to the beautiful beaches of Camburi and Camburizinho. Far beyond expectations. All knocked during this stay. The combined living room and kitchen is very tastefully decorated. Eye for detail! Very good beds. Outside, it's lovely to lie down by the pool. In short; wonderful place! A soothing retreat surrounded by lush forest in the heart of Brazil! 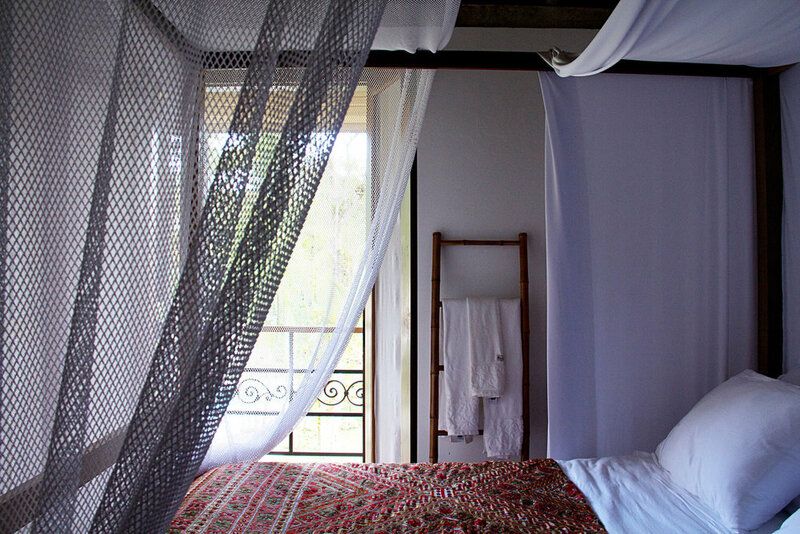 Estalagem was established for a taste of living cultures and unforgettable places that we experience throughout life. Created in an Atlantic Rainforest atmosphere - Brazilian Mata Atlântica - as an expression of freedom, our area offers a haven for you to rediscover who you are: a being of nature. We offer these atmospheres for you and share in our space what the world has offered us with joy: nature, art, culture, cuisine and music; with the intention of produce good affective encounters and rest when pleasant rest. Estalagem is very close to two of the most beautiful beaches in Brazil, Camburi and Camburizinho, where the river Camburi flows. It is among the flowery Serra do Mar mountains overlooking the Atlantic, along the infinite beauty of the nature colors and songs of birds, waterfalls that descend the mountains cradling the breezes of wind, the trees in bloom and the infinite beauty of the blue sea crystal clear. An eclectic retreat, during the long days of sunshine and rain find a thriving atmosphere rife with artists, surfers and local fishermen. 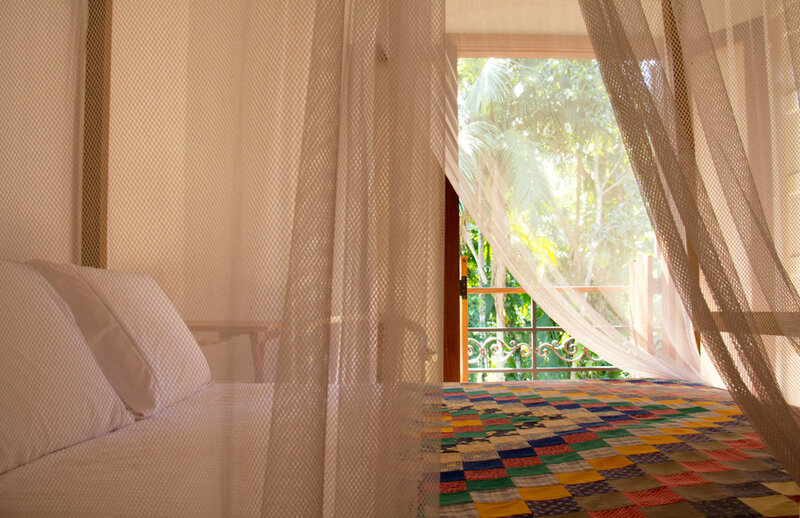 For those seeking a break from the fast pace of city life, discover a calm and relaxed approach to life in our retreat. 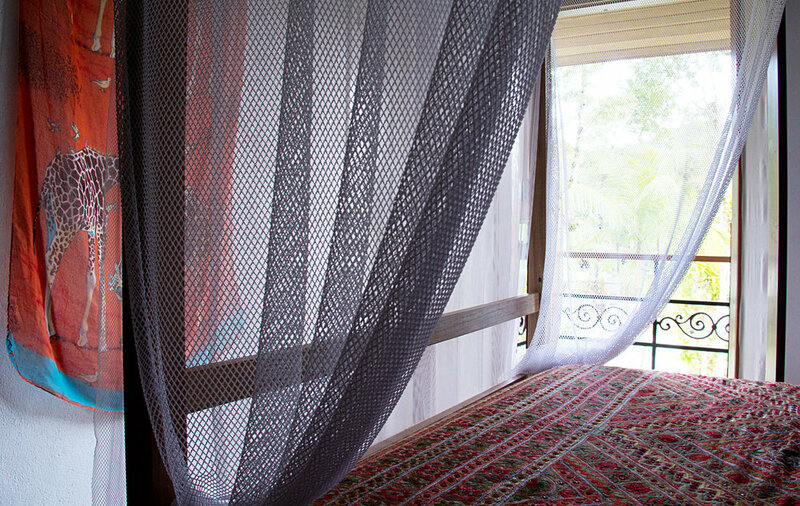 all with the sumptuous Queen-size bed with canopy and air-conditioning. Situated on the ground floor, this delightful suite is outfitted with a wooden hot tub, perfect for unwinding in comfort while enjoying views of lush surroundings. 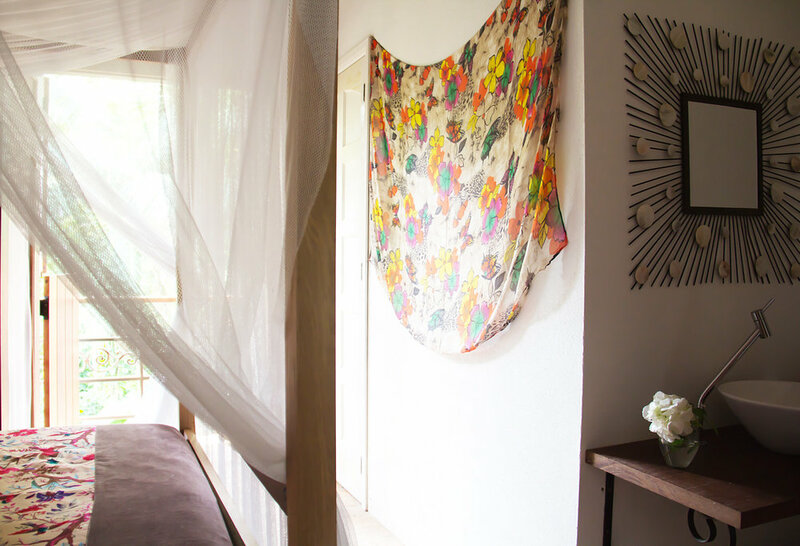 Step onto your private deck with lounge chairs and views of the Atlantic forest. 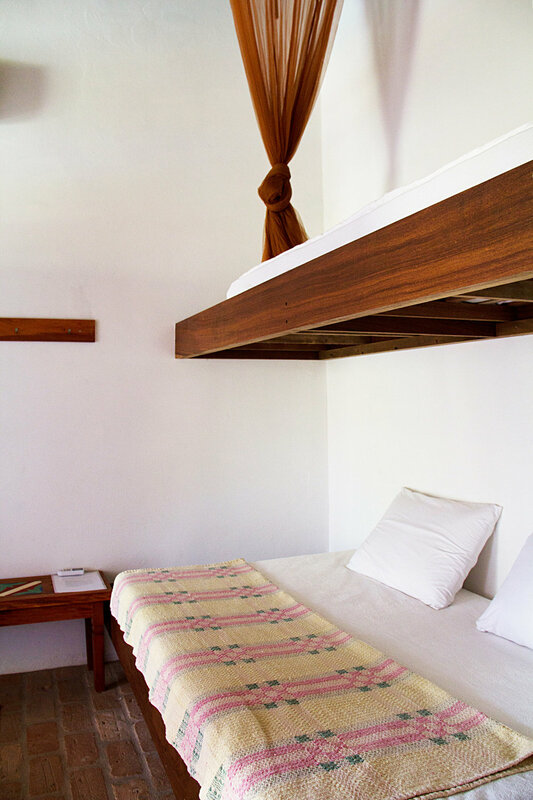 This suite includes air conditioning, private bath and ceiling fan, for your ultimate comfort. Accommodates 2 guests. A soothing and inviting apartment with plenty of luxuries and amenities, our Rhodes Deluxe Apartment exudes an ambience of serenity and luxury and features an outdoor deck with lounge chairs and views of the Atlantic Forest - perfect for relaxing amidst nature. 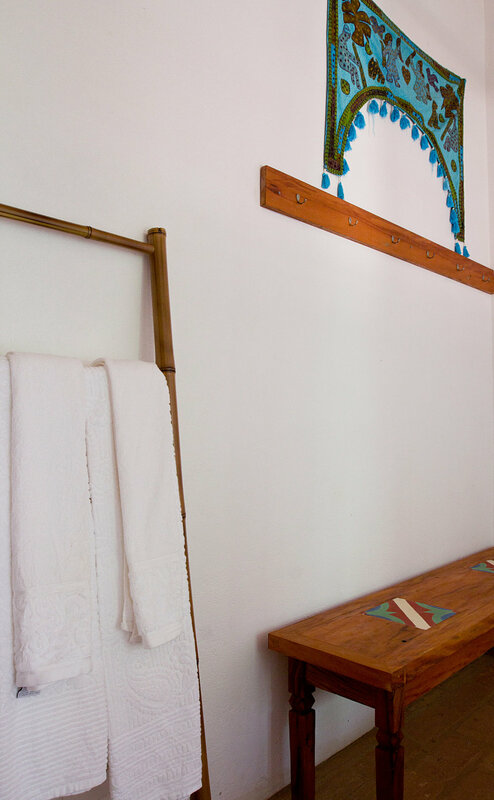 This suite includes air conditioning, private bath and ceiling fan, for your ultimate comfort. Accommodates up to 4 guests with extra beds. 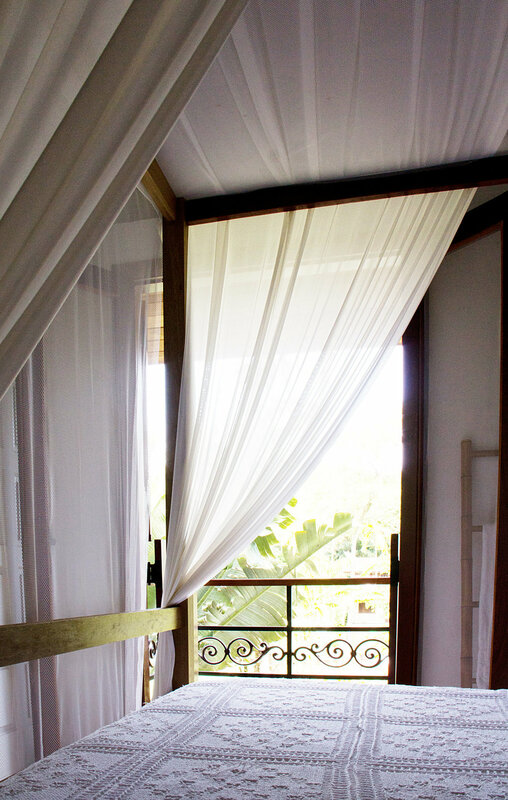 Upper floor rooms overlooking the Atlantic Forest, pool or garden, these rooms features a sumptuous queen-size bed with canopy. Wake up in the serenity of this inviting room, complete with a balcony where you can enjoy inspiring views and fresh breezes. 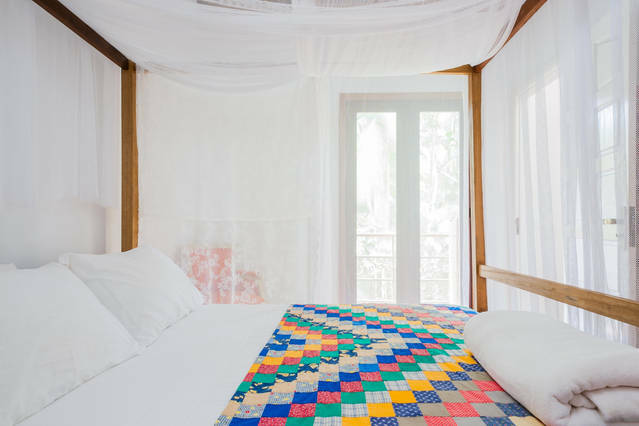 This suite includes air conditioning, private bath and ceiling fan, for your ultimate comfort. 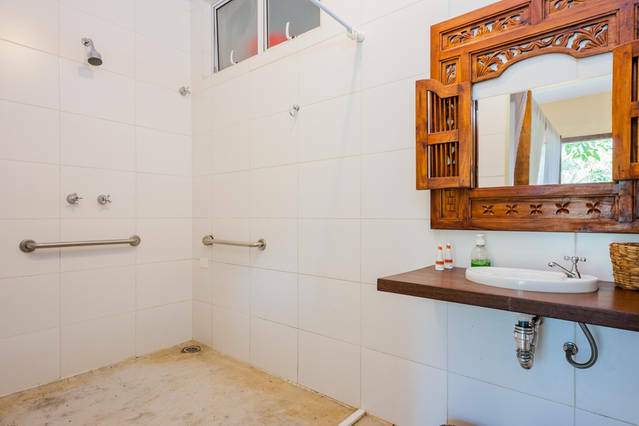 Accommodates 2 guests. 5 suites in this category. 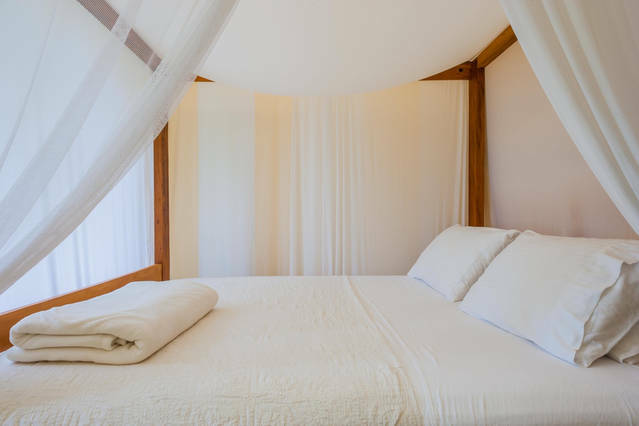 An upper floor room overlooking the pool and garden, this room features a sumptuous Queen-size bed with canopy, a double bed and a single bed. Wake up in the serenity of this inviting room, complete with a balcony where you can enjoy inspiring views and fresh breezes. 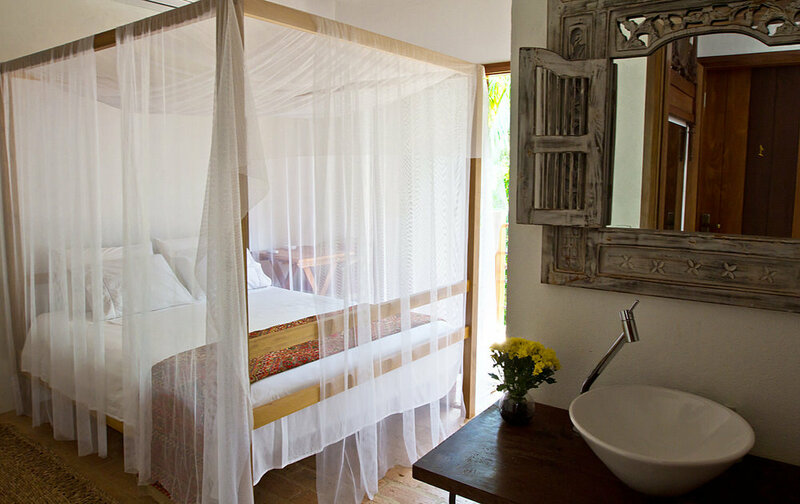 This suite includes air conditioning, private bath and ceiling fan, for your ultimate comfort. Accommodates up to 5 guests, this suite is ideal for family or friends. An accessible room with plenty of comforts, our Barcelona suite offers wheelchair accessible accommodations to ensure all of our guests can enjoy this serene retreat. 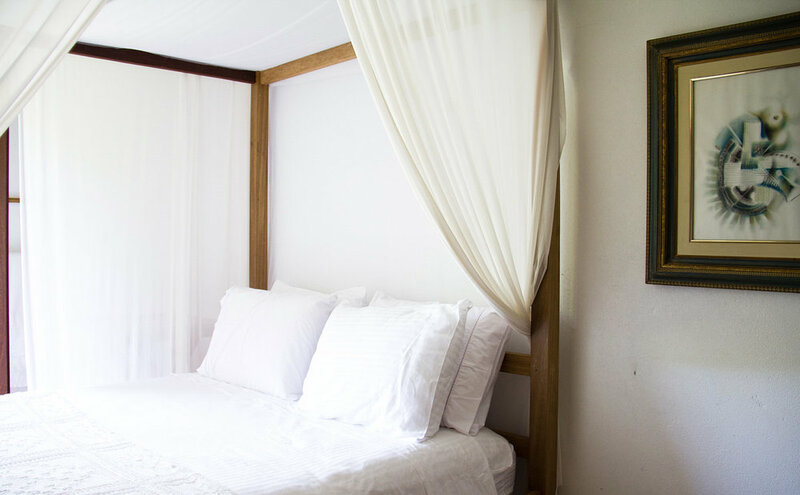 Unwind in a sumptuous queen-size bed while gazing out at the lush Atlantic Forest, or simply enjoy the front garden and pool area. 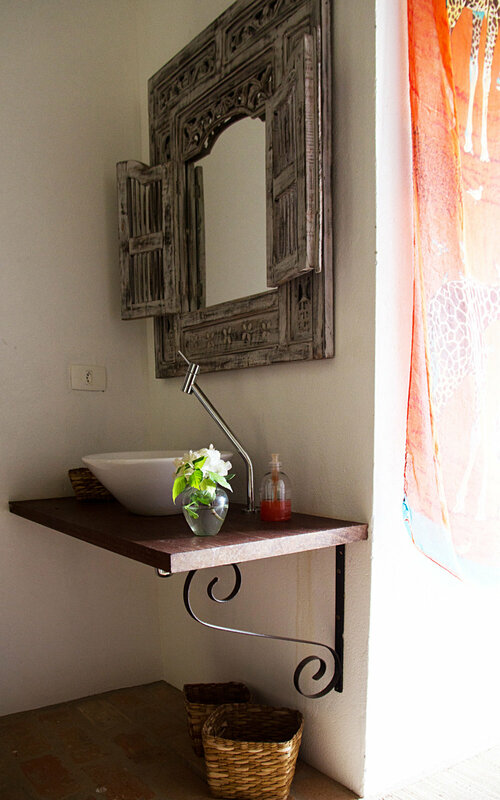 This suite includes air conditioning and private bath, for your ultimate comfort. Option of 2 more single beds. Accommodates up to 4 people with extra beds. Estalagem is in a prime location in the hinterland of Camburi, amidst the Atlantic forest, 2 km from the beaches of Cambury and Camburizinho. Camburi is known for its unique combination of beaches, islands, mountains, rivers, waterfalls and the Atlantic Forest. The beaches of Camburi and Camburizinho are divided by a peninsula and Rio Camburi, revealing a unique scenery. Beaches of fine white sand, crystal clear waters and perfect waves, being one of the favorite spots for surfers. Considered the gastronomic center of the northern coast of São Paulo, among the many restaurants, bars and cafes, we highlight the Manacá, with its coastal and sophisticated cuisine, awarded by several guides; Acqua Restaurant, Mediterranean food with an amazing view of the Atlantic Ocean; and Ogan, contemporary cuisine. In Camburizinho beach, on the mountain, with access to the beach is the Pura Bar with drinks and appetizers, and a view of the sunset breathtaking. In the center of Camburi are wonderful places like bars, pastry shops, tobacco shops, bookshops, decor stores, nightclubs and some good shopping. Only minutes from Camburi are Baleia, Barra do Sahy, Juqueí, Barra do Una, Boissucanga and Maresias beaches. The atmosphere composed of the Atlantic Rainforest, Serra do Mar, rivers, waterfalls, natural pools and old cocoa farms give a magical touch to the Hinterland of Camburi, also known as Cocoa Hinterland. Fishermen, local artists, eco guides and fine restaurants stand out on site. Among them, the Taioba Gastronomy, of the renowned chef Eudes Assis, with the traditional cuisine 'caiçara', many fish and fresh seafood prepared with excellence; the Atelier de cerâmica Luzia Batista, with beautiful personalized ceramic pieces; and Pizzaria do Beto with delicious pizzas made in the wood oven. Host the wedding of your dreams in our idyllic venue. 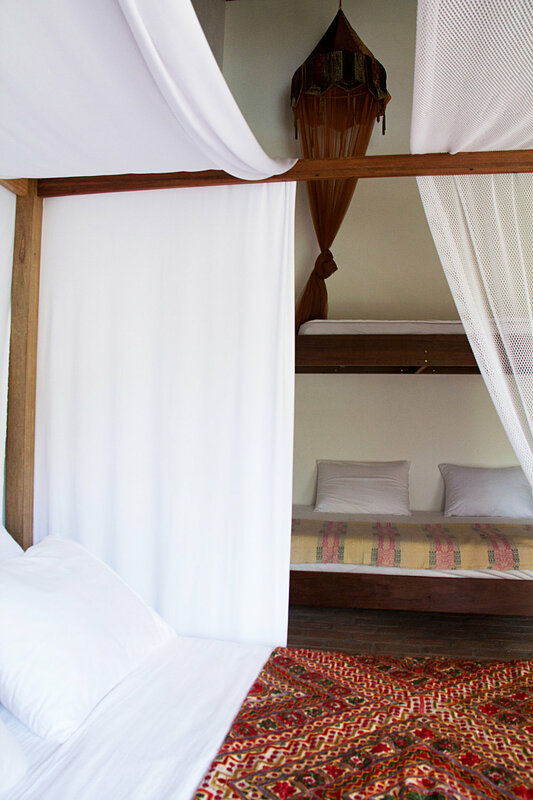 We offer the perfect venue space, along with romantic accommodations nestled within the Atlantic forest and near Camburi Beach. Let us customize the perfect space for you - we'll create an atmosphere of fun and relaxation to complement your special day. From designing a tantalizing menu of local flavors infused with delicious ingredients to setting an unforgettable scene to mark the rest of your lives, we'll take care of all the details so you can truly unwind and enjoy yourselves. Take the opportunity to make your honeymoon in a romantic suite of great charm, with a Jacuzzi or wooden hot tub. You can have a party for up to 150 people, with a romantic luau by the fire and the pool, the make of the bride, buffets of great chefs, aphrodisiac massages and more. We have the wooden chapel in brazilian caiçara style so you can concretize the celebration of love and bring delicacy to this important moment of your life, surrounded by fresh air and a romantic mood. It is no wonder that the Estalagem is the space of desire to celebrate love. 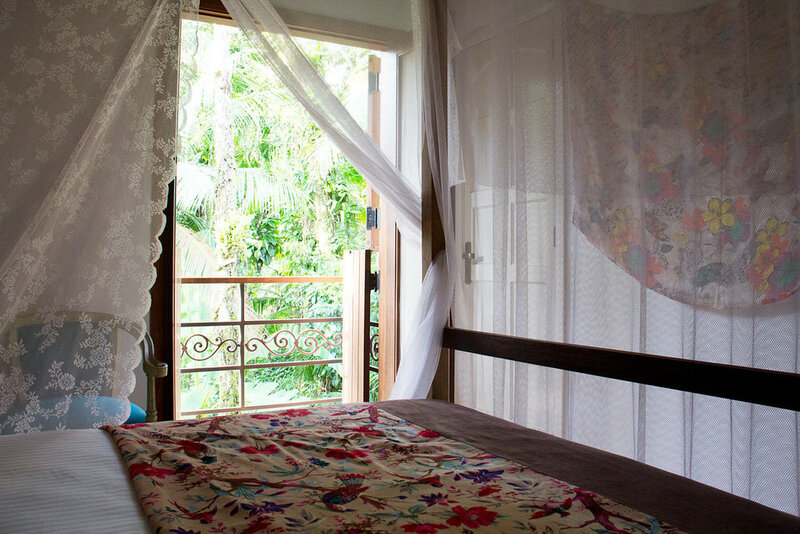 An incredible space in the heart of the Atlantic Forest, where the splendor of nature with its flowering trees and its singing birds adorn the environment. The Estalagem has a room for celebrations with great comfort and good taste. 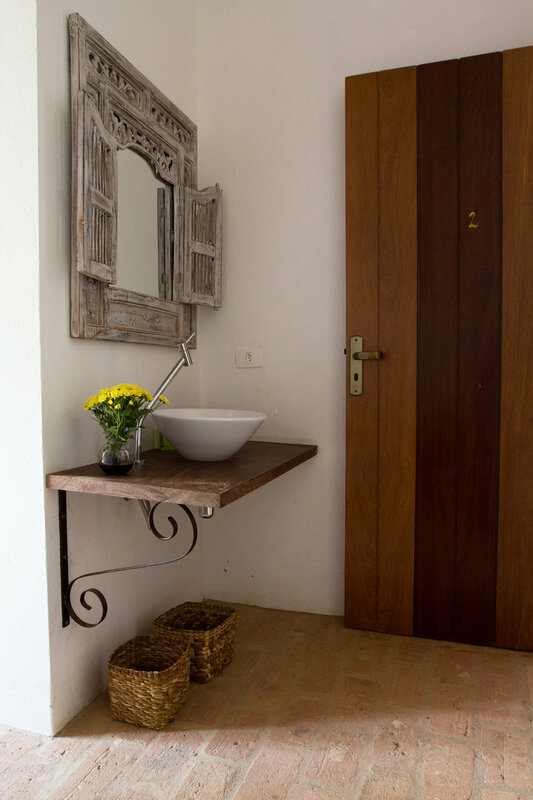 The rustic and cozy decor invites you to linger and enjoy a delicious space. The harmonious garden and its small wooden chapel made from fishermen's boats, the garapeira, are perfect for beautiful outdoor ceremonies in the most tropical climate. Contact us for more information. It will be a pleasure to host you and your guests! When booking the Estalagem to celebrate your Wedding, a romantic and exclusive Luxury Suite with Jacuzzi will be available for the bride. Unwind in a luxurious room, complete with a Jacuzzi with hydro massage for your ultimate comfort. 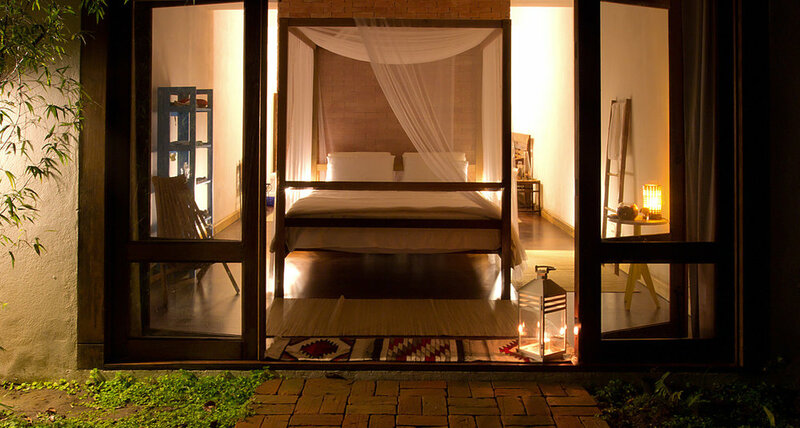 Stay in this upper-floor deluxe suite and enjoy a private bath, two balconies overlooking the Atlantic Forest and lush gardens and a mini fridge for the perfect cocktail. 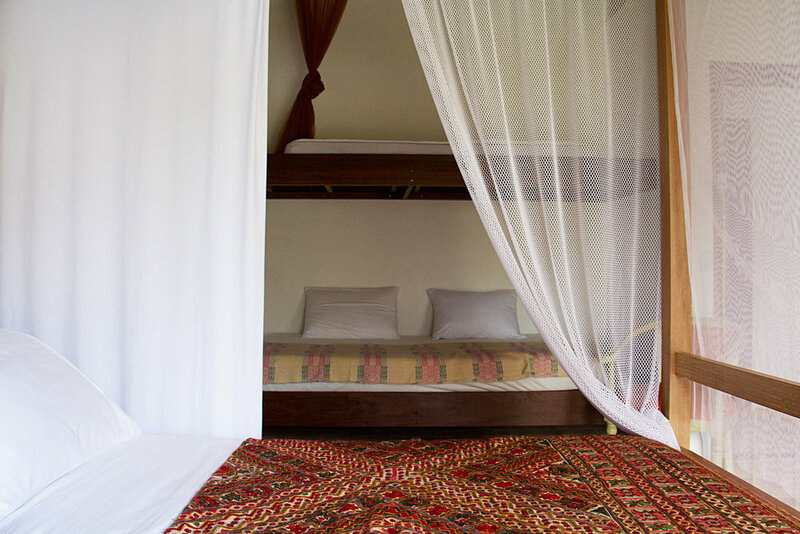 This suite includes air-conditioning, private bath and ceiling fan, for your ultimate comfort. Estalagem has space for celebrations, parties and events for up to 150 guests in the common areas: 2 living rooms, garden, outside deck beside the Atlantic forest, the pool area and a new wooden space next to the house. Hosting - maximum capacity of 26 guests, accommodated in 10 suites. Venue - with an area for up to 150 people and 6 bathrooms (1 accessible to wheelchair users), there is room for all of your party. Charming venues - say "I do" at our wooden chapel, an unforgettable moment in the heart of Brazil's picturesque forest. Huge outdoor lawn - host your party here under the bright Brazilian sunshine in our idyllic setting. Mini Weddings - perfect venue with all the charm and coziness to the guests. Romantic Luau on fire - with live music, drinks and appetizers to special guests the day before or after the wedding (suggestion). Kitchen equipped - industrial stove with oven, wood stove, counter and 3 sinks. External area for kitchen installation, if necessary.